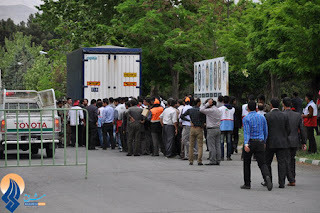 (Beirut, April 30, 2013) – The Iranian government is increasingly violating workers’ rights to peaceful assembly and association, Human Rights Watch said today. Dozens of labor and independent trade union activists are in prison for speaking out in defense of workers. 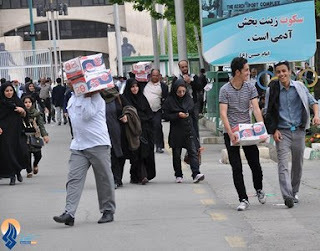 Human Rights Watch called for the government to end the crackdown and free labor rights advocates in anticipation of International Workers’ Day on May 1, as part of a joint campaign by Iranian and international rights groups to highlight the plight of workers. Labor rights groups say that the rights of Iranian workers have come under increasing attack during the presidency of Mahmoud Ahmadinejad. Security forces have harassed and arbitrarily arrested an increasing number of striking workers, who are then subjected to politically motivated prosecutions and unfair trials. The Iranian government’s stranglehold on unionization and crackdown on labor rights activists have left workers without a voice to influence government policy and working conditions, even as the country’s worsening economic situation is pushing many into poverty, Human Rights Watch said. Independent trade unions are banned in Iran. More than a dozen labor activists are in prison for exercising their right to freedom of assembly and association. Many others have been released on bail, with cases pending against them in revolutionary courts. 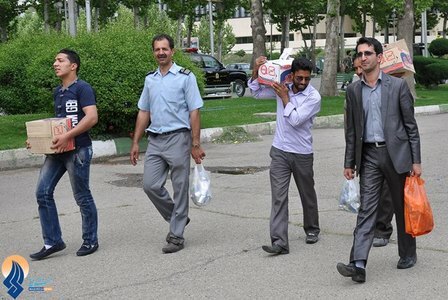 In a recent action, on April 15, 2013, authorities summoned Reza Shahabi, a union leader, back to Evin prison, in Tehran, to complete his six-year sentence for “propaganda against the state” and “collusion against national security” after granting him leave to get medical treatment. Shahabi was treasurer and member of the Syndicate of Workers of Tehran and Suburbs Bus Company, an independent trade union repeatedly targeted by the authorities. In early March, authorities rounded up at least seven prominent labor rights activists in Sanandaj, the capital of Iran’s Kurdistan province, apparently on “national security” charges. Earlier in 2013, Iran’s Supreme Work Council, a government body charged with promulgating labor regulations, set a 25 percent minimum wage increase (487,000 toman per month, about US$ 140) for the coming year. A group representing Tehran workers at the Islamic Labor Council, a state-sanctioned body that ostensibly acts to protect the rights of workers in lieu of independent trade unions, has officially submitted a complaint to the body demanding a larger increase. Article 41 of Iran’s labor law requires authorities to take the rate of inflation into account when establishing the minimum wage. The official inflation rate is close to 32 percent, but many economists say the real rate may be above 50 percent. Iran’s labor law does not recognize the right to create labor unions independent of government-sanctioned groups such as the Islamic Labor Council. Nonetheless, workers have formed large, independent unions, including the Syndicate of Workers of Tehran and Suburbs Bus Company, Haft Tappeh Sugar Cane Workers’ Syndicate, and the Iran Free Workers’ Union. Since 2005, authorities have repeatedly harassed, summoned, arrested, convicted, and sentenced workers affiliated with these and other independent trade unions. Most of these arrests have taken place during International Workers’ Day celebrations or strikes the unions have called, often for back wages that have not been paid for months. For example, activists told Human Rights Watch that the Saveh and SAFA Rolling and Pipe Mills Company suspended payment of wages to 2,300 of its workers for three months at the end of the Iranian calendar year, March 2013, and that workers involved in a road construction project in Kohgiluyeh and Boyer-Ahmad province had similarly not been paid for seven months. About 80 percent of workers are working under temporary, short-term or at-will employment arrangements, which severely restrict their benefits and provide little protection from summary firings by business owners, labor activists say. The situation is particularly dire for the most vulnerable workers: women, children and Afghan migrants. Women are often the first victims of mass layoffs by companies, activists say, in part because of costs associated with providing health insurance and maternity leave. Labor activists say that some companies have sought to shirk their legal responsibilities to female workers by pressuring them to promise they will not get pregnant as long as they work for the company. The number of child workers under age 15 has also increased, in contravention of article 79 of Iran’s labor law which prohibits employing anyone under that age, according to the official Iranian Labour News Agency. According to figures published by Iran’s parliamentary research center in September 2012, more than 90 percent of the 3.25 million children out of school were working. Economic and financial sanctions imposed by the United States and European Union against Iran over its alleged nuclear weapons program may have worsened the plight of workers, labor activists told Human Rights Watch. An increasing number of factories have laid off workers in the past few years since sanctions tightened. According to official statistics, about 50 percent of manufacturing facilities in Iran have shut down production or are on the threshold of doing so, and many large factories are operating at around 30 percent capacity. According to the head of the Workers’ House, a government body, more than 100,000 workers lost their jobs between May 2011 and May 2012. Labor activists who are currently in prison for peacefully exercising their right to peaceful assembly and association include: Reza Shahabi, Afshin Osanloo, Shahrokh Zamani, Mohammad Jarrahi, Behrouz Alamehzadeh, Behrouz Nikoufard, Alireza Saidi, Ali Azadi, Ghaleb Hosseini, Pedram Nasrollahi, Rasool Bodaghi, Abdolreza Ghanbari, Mehdi Farhi-Shandiz, Sharif Saedpanah, and Mozafar Salehnia. Afshin Osanloo, who has been in prison on false charges for more than three years now, has not been allowed medical leave even though he suffers from injuries sustained as a result of torture during interrogations in Evin and Sanandaj prisons. Others, like Behnam Ebrahimzadeh, Behzad Farajollahi, Khaled Hosseini, Vafa Ghaderi and Khalil Karimi are currently out of prison on medical furlough or bail. Article 22 of the International Covenant on Civil and Political Rights (ICCPR), and article 8 of the International Covenant on Economic, Social, and Cultural Rights (ICESCR) protect the right to form and join labor unions. Iran is a party to both of these treaties. Iran is a member of the International Labour Organization (ILO), but has so far refused to sign conventions 87 (Freedom of Association and the Protection of the Right to Organize Convention) and 98 (Right to Organize and Collective Bargaining Convention) of the ILO treaty. Iran is also a party to the Convention on the Rights of the Child and ILO Convention 182 on the Worst Forms of Child Labor; it has not ratified ILO Convention 183 on minimum age for work.
" 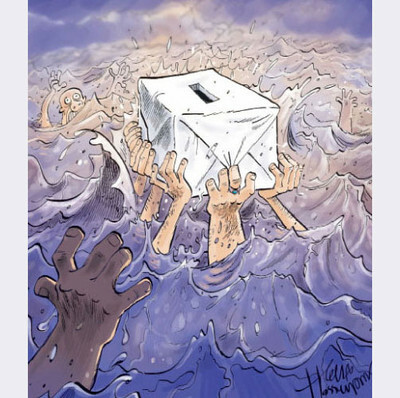 Law " - Cartoon by Iranian Cartoonist Bozorgmehr Hossein-pour . 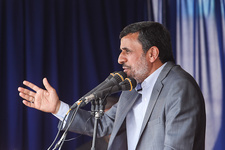 Ahmadinejad continues creating tension by his rhetoric with other officials of the Islamic Republic at the time when Khamenei said ; creation of tension at this time is treason to the Islamic Republic ! 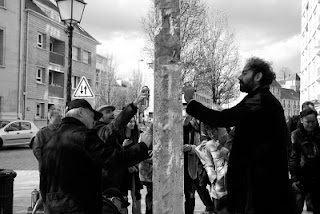 Ahmadinejad in his tour of city's - in the city of Qom Said : "There are words that i will say it later " . Another paper reported him saying : " If God willing life left ,i have words that i will say it later.He then added : They have buried the money of the nation under ground and ......"
His way of saying makes many officials angry and many of these conservative officials including Khamenei who have supported him for years , now believe , he is creating problems for them and for the Islamic Republic and in the past ,time and time ,he showed that he is above the parliament and the constitution including the laws. In short , Khamenei and other conservative officials of the Islamic Republic who have supported him for many years created the Don Quixote & Frankenstein. No one knows what plan or project he has for the coming presidential election and some believe he may surprise everyone by Russian Putin style election by supporting the nomination of Esfandiar Rahim Mashaei ( the father in law of his son ) and one of his confidante. "About the claim on those arrested in Canada ,they did not presented any supported document. Thought of radical group particularly the radical Al Qaeda from the political and faith views doesn't go in accordance with Iran.We disagree with any kind of terrorism and assault which will endanger the lives of innocent people , our nation is the biggest victims of terrorism and we would never encourage these kinds of phenomena." The Radical Government of Canada in recent years put in its agenda the project of Iran - phobia and had followed hostility actions and because of these actions trying to connect these issue with our country. These is because of the radical and incorrect behavior of the current Canadian Government ." However in the past Political prisoners released from Iranian prison claimed they have learnt that, Some elements of Al Qaeda were kept in special secured prison cells . It was also reported that some family members of Al Qaeda including Bin Laden Daughter were seen in Iran. Power struggle among different factions in the Islamic Republic a reality !!?? Yesterday Ahmadinejad in his travel to Khouzesta province said: "They have sent me a message and told me , if you get into over cheekiness ,we will make your life miserable." 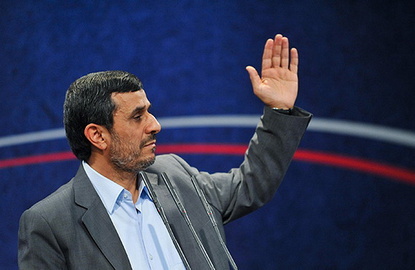 Ahmadinejad in his tour of provinces among the people of Haftkal in Khouzestan province said: "They have sent me a message and told me, if you get into over cheekiness , we will make your life miserable ." In Response to those who sent the message, Ahmadinejad Said : Well lets see, you are nobody and if we show just a small portion of each and everyone of your case file , you wouldn't have any place among nation." The factions among Islamic Republic in Iran including Ahmadinejad's faction in presidential election race on June 12 is getting to a new stage. 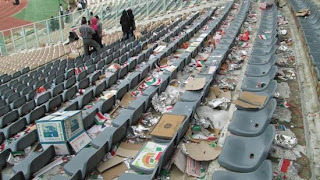 Ahmadinejad's Government Call on people for a gathering in Soccer stadium before presidential election on June 12 ! Government in a letter demanded its Government employees to attend today's (Thursday ) gathering at the soccer stadium in Tehran from all over Iran.People as far as " Kohkilouyeh " by Bus & Minibus attended the gathering ( With billions of tuman expense of Government of course ). 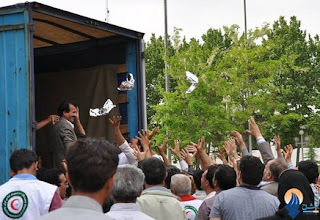 Iranian believed this gathering was organised by government and spent billions of Iranian money for election purposes as a show of force by Ahmadinejad and his cabinet minister, among them Esfandiar Rahim Mashaei to announce itself as a candidate at the gathering , But he was absent and Ahmadinejad attended the stadium and the government distributed foods including sandwich among the people. No one knows what is the plan of the Government for the presidential election and if any of Government cabinet minister would nominate themselves. This picture shows aftermath of the meeting - When people finished their sandwich and made a mess. Ahmadinejad Government officially ends in less than two months and the presidential election will take place in June 12. It was called “Terror Club” – an hour-long “documentary” that aired on Iranian state TV in August 2012. The 12 individuals – seven men and five women – featured in the show, appeared, one by one, in front of a camera, “confessing” to their involvement in the killing of Iranian nuclear scientists over the past year. Beyond their starring role on television, no clear details about the arrest and detention of these 12 people are known. It is not known if any of them have been charged or tried – despite the recent announcement that 18 unnamed people will shortly go on trial for these murders. But it is known that all 12 could face the death penalty if they are found guilty of the alleged killings. This type of televised “confession” is far from uncommon in Iran. Suspects are forced to appear on national or local television to admit to alleged crimes – often before their court proceedings have even started. These “confessions” are then accepted as evidence in court, seriously undermining any prospect of a fair trial. Many defendants have later retracted their “TV confessions”, stating that they were coerced into making them, sometimes under torture. But these TV “confessions” are part of an overwhelmingly unjust trial system in Iran. The accused frequently face extended pre-trial detention which far exceeds limits provided for in Iranian law. In this time, they are routinely denied access to a lawyer or their family for weeks or months while the “investigation phase” is concluded, during which many are tortured or otherwise ill-treated. In such circumstances, the trial itself – often cloaked in secrecy – is inevitably unfair. In Amnesty International’s report on death penalty statistics across the globe in 2012, the section on Iran once again makes for grim reading. The country is the second highest executioner in the world, only behind China. At least 314 executions were officially acknowledged by the authorities in 2012, but the real number is almost certainly much higher. 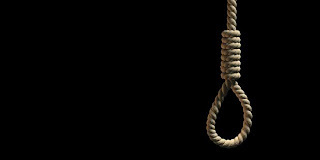 More than 200 additional executions were reported to Amnesty International by reliable sources. One highly illustrative example of the use of the death penalty in Iran that features in the Amnesty International report is that of five Ahwazi Arab men who are currently on death row, some of whom were forced to confess on television to “crimes” they later retracted. The five men – Mohammad Ali Amouri, Sayed Jaber Alboshoka, his brother Sayed Mokhtar Alboshoka, and teachers Hashem Sha’bani Amouri and Hadi Rashidi – are activists for Iran’s minority Arabic-speaking Ahwazi population, which faces discrimination by the central government. In the early 2000s, the men started an organization called al-Hiwar (“Dialogue” in Arabic) to promote Arab culture in the province of Khuzestan in south west Iran. 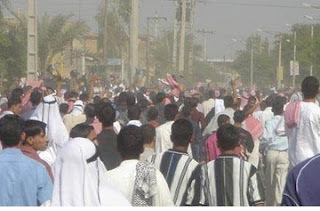 But after violent protests broke out in Khuzestan in April 2005, the authorities responded with a crackdown on Ahwazis, and revoked the permit of al-Hiwar. 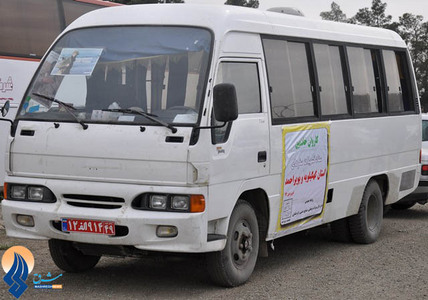 Forced underground, the five men reportedly started collecting information on human rights abuses against Ahwazis and spreading it outside of Iran. After years of harassment by the security services, the five men were finally arrested in early 2011, a few months before the anniversary of the April 2005 protests, when tensions often run high in Khuzestan. They were initially held in an unspecified location without access to lawyers or contact with their family members. There are reports that several of them were tortured in custody. Two of the men – Hashem Sha’bani Amouri and Hadi Rashidi – then appeared on the Iranian state TV channel PressTV in December 2011 and were seen “confessing” to national security “offences” including – in the case of Hadi Rashidi - participation in an attack on four officials. But it was more than another six months before they faced trial. All five were sentenced to death after convictions of “enmity against God” and “ corruption on earth”. Kamil Alboshoka, 29, grew up with the five men, two of whom are his cousins and the other three close friends. In 2006, he fled Iran for London where he has become an outspoken campaigner for the right of Ahwazis. “It was very difficult to see Hashem and Hadi on TV, confessing to something I know they did not do. I know that the authorities in Iran use the death penalty against Ahwazi Arabs to suppress us,” he said. In Iran, death row inmates can be executed at short notice, and there is no need for the authorities to inform the families prior to the execution. Kamil has been badly affected by the stress of knowing that his friends and cousins - handed death sentences in July 2012 - could be killed any day. "I have not had a balanced life since July. I have had problems sleeping and I can’t concentrate. I even had to postpone my university exams because I wasn’t able to study,” he said. In March 2013 the five men started a hunger strike in protest against their death sentences, as well as against the torture they say they have been subjected to in custody. “Making someone ‘confess’ to their crimes on national television before their trial has even started makes a mockery of international fair trial standards,” said Ann Harrison, Amnesty International’s Deputy Director for the Middle East and North Africa. Persian Gulf area was shaken twice this Week ! 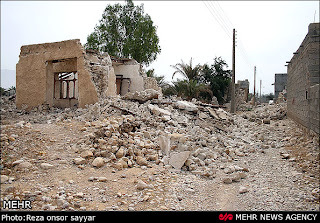 According to news, South -Eastern part of Iran once again was shaken by 7.5-8 scale measure Earthquake and Mr. Hatam Narouei the Governor of Sistan & Blouchestan province rejected about the casualties . Earlier it was reported that 40 peoples have lost their lives.the Islamic regime officials do not want reporter to report the number of casualties and have asked reporter just to report whatever the headquarter of the crisis announces . Sardar ( Comander) Radan speaking with ISNA said: " In the primary stage ,the assisting forces are dispatched to the area to bring security and order." 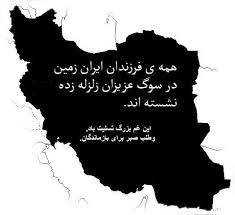 Our sympathy with the people of Sistan & Blouchestan province ! -The 2009 events ( presidential coup and peoples street protest with slogan : Where is my vote) have began from where a few didn't wanted to obey the law and lead the people to street revolt . -In a few months we have election and all officials must try to calm the political situation of the country and not to let the situation to become turbulent. - Sometimes a word or ill considered action may cause turbulent in the political environment. Firoozabadi warned officials not to create tension. Officials must pay attention to the depth of the hostility of those who are not with the system and Not to do something which may bring tension among the society. Speaking on Sunday in Tehran - Beheshti Medical School , Rahim Safavi warned in case of any " Sedition and revolt " before and after the presidential election , it will be strongly confronted with . 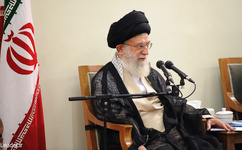 He warned those whom he called counter revolutionaries ,misleads and corrupt and said if they wanted to create "revolt and sedition" in Tehran and other city's , it will be strongly confronted with.He asked offices and organizations to take precaution measures from any internal and external revolt. 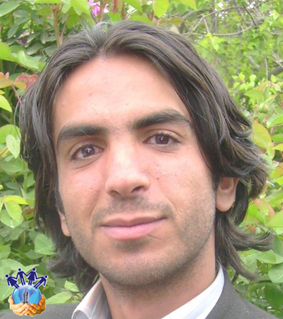 News reports about the arrest of Pouria Farazmand a blogger from the city of Kermanshah, by security forces inside the university ,while other students witnessed his arrest. Fatemeh Kharadmand a reporter in the field of Health care , hygiene or sanitation is also summoned by Tehran security police forces. News report indicates that, Ms. Fatemeh Kharadmand is under intense pressures by Ministry of Information . In the past Fatemeh Kharadmand was working for : Hygiene magazine , Hamshahri newspaper, Ketab and Kharadnameh. She had also worked for Musavi's presidential candidacy . She was also involved in the case file known as " Ghalame Sabz" . The security police forces summoned Ms. Kharadmand to the police station while she had no one to take care of her little boy who suffers language difficulties. Ms. Fatemeh Kharadmand is the wife of Masoud Lavasani a blogger and journalist who escaped the country to avoid the arrest and detention. In the past - On December 2011, Ms. Fatemeh Kharadmand was arrested at her home by the agents of the Ministry of Information and was transferred to women's ward of 209 in Evin prison and spent 25 days in detention and was released with 50 Million Tuman Bail. It Happens only in undemocratic regimes including Islamic regime in Iran ! The man was charged falsely and spent two years in custody and finished the sentence given to him by judge and he was about to release ,when again new sentence is given to him . This is justice Islamic regime style in Iran. Mohammad Seifzadeh is a lawyer and a prominent human rights defender . He is currently in Rejaei -Shahr prison. Mr. Seifzadeh suffers from Kidney , liver and back problem. Islamic regime judges in a new judgement sentenced him to another six years imprisonment, because of his protest to the new charges and court date and for not attending the court. Earthquake in Southern part of Iran - Sympathy with people of "Bushehr" Province ! On Tuesday April 10 an earthquake with 6.1 measure shook southern Bushehr province of Iran. Most houses in this part of the country are made of mud and stone.Based on the news 38 people are killed and many hundreds are wounded and their houses are destroyed.Islamic regime in Iran ignores these part of the country ,while most of the wealth of the country ( The oil ) is coming from these part .IRAN WATCH CANADA expresses its sympathy with Bushehr people. Iranian People are getting closer to the Presidential Election on June 12 ,2013 ! Committee of Human Rights Reporters – Reza Akvanian, blogger, poet, writer and human rights activist was detained by security agents on Sunday March 24, 2013 at approximately 3am. According to CHRR, after being held incommunicado for 2 weeks Akvanian was finally allowed visitation with his family on Saturday April 6th. According to his family, bruising and signs of beatings were visible on Reza Akvanian’s body pointing to the severe physical pressure put on him by agents in efforts to obtain a false confession. Another political prisoner have died inside prison in Iran ! Alireza Karami Khoramabadi a security political prisoner of the Islamic regime in Iran have died in the hospital on last Saturday. While in coma , he was handcuffed & chained to the bed of Imam hospital for 10 days . Alireza was suffering from heart problem and in the past he had a bypass operation and the doctors had warned prison officials about his situation. Alireza was in Rejaei-Shahr prison. 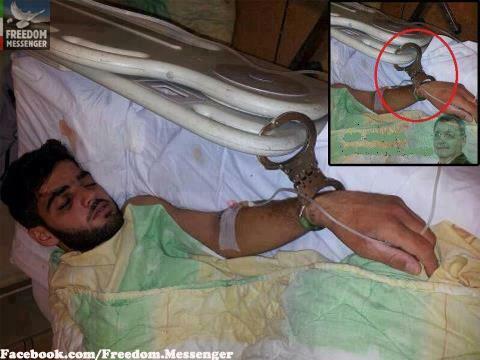 Two Weeks ago in the last minute he was transferred to the hospital while was severely suffering from heart problem. Interrogators and torturers of the Islamic regime in Iran won't allow prisoners suffering from illness to be transferred to a hospital outside the prison unless it is the last minute. In the past many political prisoners have died while in custody including Zahra Kazemi ( the Iranian-Canadian Photo Journalist ) , Hoda Saber ( Meli Mazhabi political prisoner) , Satar Beheshti ( Yesterday MP's called interior Minister to come to the Parliament to answer question about his death while in custody) and many more. Alireza Karami-Khoramabadi was accused of forcing an airline to take him to Iraq .While in Iraq , the Iraqi Government handed him to Jordan and after spending a year in Jordanian prison , the Jordanian Government handed him to Islamic authority in Iran,where he was sentenced to death, but later the sentencing was lowered to life imprisonment. Alireza Karami had spent 16 years in prison - He spent one year out of this 16 years in solitary confinement. Ministry of Information of the Islamic regime in Iran : Counter Revolutionary Journalist joined the London Circle ! 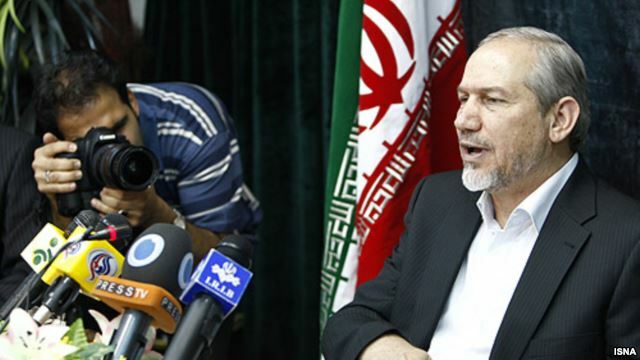 Picture : Minister of Information of the Islamic Republic of Iran. "Counter Revolutionary Journalist joined the London Circle. Masoud Lavasani, the journalist who was connected to counter revolutionary networks and was connected to the case file of BBC -Farsi and was under persecution by the Ministry of Information ,escaped from the country. " Pictures: Masoud Lavasani with Son. "This journalist was connected for a long time with counter revolutionary networks and was under persecution by the Ministry of Information, he Escaped illegally from the country and have joined the counter revolutionary elements in London." "Counter revolutionary Websites and networks are very happy from this escape and joining , they happily reported this news and defended the actions of Masoud Lavasani." "The agents of the Ministry of Information several time acted to arrest him but without any success, because he had planned to escape long before when noticed he is under persecution and the charges , he illegally escaped the country and have joined the counter revolutionary circle in London." BBC and other websites and networks that have close relation with Lavasani confirmed his escape and his joining to the London circle of counter revolutionaries." Regime Fears for People's Uprising &Iranian People are waiting for an Opportunity ! According to report by Karim Dahimi Human Rights activist many Iranian -Arab of Khouzestan Province in the South - near Persian Gulf were arrested and detained by the Islamic regime in Iran.The names of those arrested are too many to write here. Every Year Iranian -Arab youth commemorate "April, 2005 Uprising" .In that uprising many Iranian -Arab were killed or arrested and detained by security forces of the Islamic regime in Iran. This year since March more than 160 Iranian -Arab were arrested by the security forces of the Islamic regime. 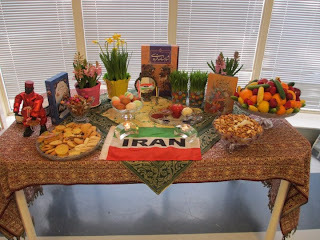 Happy Nowrouz and Happy New Year to all & Happy " Seizdah Bedar"